Let’s have a practical look at how PacketQ works by trying to figure out what kind of DNS ANY queries are being sent towards our name-server. This query provides a very high amplification factor. 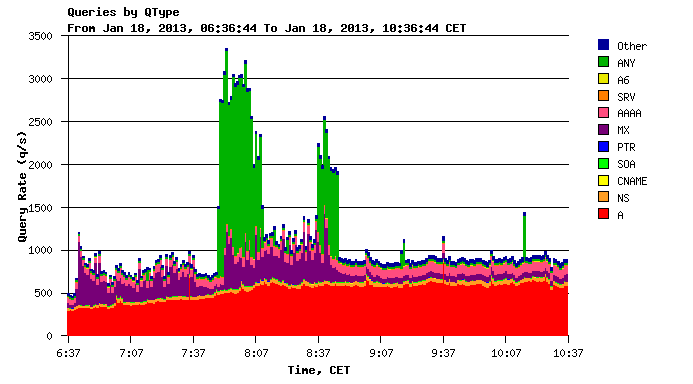 As the DNS ANY traffic burst was quite short and the source port was static; one can assume that this was not a DDoS against network bandwidth. It is more likely an application DDoS. So the assumption would be that port 27015 was actually an open (reachable) TCP or UDP port on the target system. Thanks to PacketQ it usually takes less then a minute to explain such events. If you are an operator of some DNS infrastructure and need to analyse DNS traffic anomalies I suggest you give PacketQ a try. Rickard Dahlstrand, one of the authors of PacketQ, has also made a short demo-video that shows the capabilities of PacketQ.